Wow Monday's certainly are coming round quick! 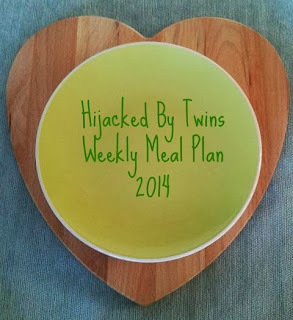 I am pleased to say that last weeks Weekly Meal Plan was a huge success! I made all of the meals except from the roast pork. This is because it was simply too hot to put a roast in the oven! I even blogged about two of our meals. Here are my delicious recipes for Cumin Topped Lamb Steaks and my Pan Fried Basa featured as my Cheap Budget Recipe. I will be cooking the pork joint that I didn't use last week for tonight's meal. I will serve it with potatoes and salad. Thanks to a huge abundance of freshly homegrown courgettes we will be having a ratatouille of green and yellow courgettes with chopped tomatoes, red onions, peppers and mushrooms topped with cheese. I treated us last week to some pigeon breasts. At the moment I am not 100% sure how I am going to serve it but I will be pan frying slices of pigeon breast in a little butter. I was recently sent some sauces to try and review. I am planning to us the very hot chilli sauce to make a creamy chilli sauce using creme fraiche. I am hoping the creme fraiche will cool it down a little as it is very hot! This will be served with rice. I will be stuffing courgettes with mince meat cooked with onions, peppers and chillis. This will be served with couscous. I am not planning for Saturday as we often decide on the day and on Sunday we are out for Sunday dinner. Just made some butternut squash soup. The Creamy Chilli Chicken sounds delicious; I’ve really enjoyed reading through your meal plans! I think that meal planning should be in every home. Having a meal plan allows you to eat healthily, eliminate meal-time stress, reduce food waste and save money. I've actually developed a meal planner from my own research with families at my cookery school. You can find it at http://siansplan.com if you wish. I have been and looked at your sites and I love what you have done! I agree that meal planning has cut down on our waste which has saved us money, but I enjoy not having the stress of wondering what to cook. Thank you for popping over, I will be sharing my Creamy Chilli Chicken next week!